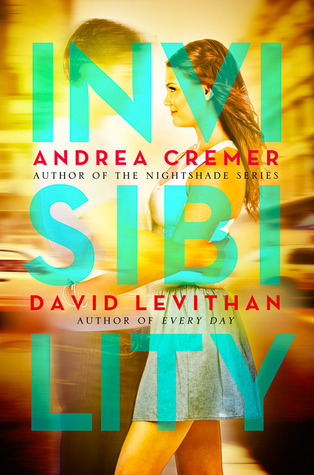 A magical romance between a boy cursed with invisibility and the one girl who can see him, by New York Times bestselling authors Andrea Cremer and David Levithan. From the critically acclaimed and bestselling authors Andrea Cremer, who wrote the Nigthshade series, and David Levithan, who wrote Every Day and co-wrote Nick and Norah's Infinite Playlist with Rachel Cohen and Will Grayson, Will Grayson with John Green, as well as many other novels, comes a remarkable story about the unseen elements of attraction, the mortal risks of making yourself known, and the invisible desires that live within us all. Andrea Cremer and David Levithan met each other in Washington, DC, even though that’s not where they live. Andrea was pretty certain she wasn’t invisible, but David confirmed that fact by introducing her to some other writers, who were all able to see her. Andrea’s novels include Nightshade, Wolfsbane, Bloodrose, Rift, and Rise. You can visit her at www.andreacremer.com and follow her on Twitter @andreacremer. She lives in New York City, quite visibly. Before writing with Andrea, David had never written a novel with a one-word title. His novels include Every Day, Nick & Norah’s Infinite Playlist (written with Rachel Cohn), and Will Grayson, Will Grayson (written with John Green). You can visit David at www.davidlevithan.com and follow his lover’s dictionary on Twitter @loversdiction. He lives just outside New York City. Stephen has lived his whole being invisible to every one without knowing exactly why. When he is a young teen, his mother dies and he exists in New York City, the perfect place to be unseen. That is until a new girl moves into his apartment building and shocks him to his very core. Elizabeth can see him and although she has major family and attitude issues, Stephen starts to fall for her. As the pair become closer and closer, Elizabeth realizes that something is not quite right with her new boyfriend. When he finally confesses that no one else can see him, she does what any loving girlfriend would do: she breaks up with him. It is so lucky that if Stephen really tries, he can be heard, so when he reveals himself to her brother, Laurie, he convinces Elizabeth that she should not abandon him because of his uniqueness. Elizabeth isn't one to back down from a fight which is exactly what landed the family in New York after her brother comes out in their small town in the Mid-West. So, with something new to fight for, Elizabeth decides to find out how he became invisible and fix it. Or at least learn to live with it. It seems that Stephen has been cursed by his grandfather and there the story really takes off in a break neck pace. Winding though New York's Central Park and other landmarks, the trio track down a lady who can see spells and Elizabeth is gifted in this manner, thus explaining why she is the only one who can see him. One major highlight for me is there is a dachshund named Tigger - sorry, you have to read the story to find the dog. I really enjoyed this tale quite a bit and would love to follow up on Elizabeth and Stephen to see if the pair continue on in any new adventures. Parents: this is best suited for mature teens because of implied sexual situations handled with taste and some language. Can't wait! Just went live at the library--can finally reserve it! Great review. I can't wait till I can reserve this at the library. Awesome that you enjoyed it. I just entered the giveaway for it on GoodReads and was hoping it was as good as it sounded. I left out so many DETAILS that made this book for me. I didn't want to spoil it for the next person but there are so many little things that add up to make this book really special.